Gardeners and backyard farmers are the ones welcome in learning how to plant asparagus. But beforehand, I’d like to raise some frequently asked questions about the plant, its propagation and culture in your backyard or in your small farm planting bed so you know also how to grow and care for your perennial plant. First off, I’m just used to buying them at popular grocery stores out there but same set of questions always pop up in my mind whenever we cook asparagus at home. So I decided to come looking for answers to my own questions by experience. Furthermore, there are literally so many asparagus recipes and ways to cook em to enjoy both benefits for health and for your taste buds but apart from that, many interesting facts were few when you search on the internet so I decided why not compile and some sort of question and answer to help gardeners and small farmers to learn more about asparagus. What type of plant do asparagus belong? What part of the plant is raised and planted in the soil? Where do you plant and what bedding is required for planting asparagus? When is the ideal season or time of the year for planting asparagus? How do you harvest asparagus? Is it possible to plant asparagus seeds? What are the chances of getting higher yield planting seed compared to the crown? Do you need to fertilize the soil and if ever, what type of fertilizer is ideal. What type of soil mixture do asparagus plants favor for maximum growth? How long is the lifespan of asparagus? Where to buy or get the asparagus planting materials? How long is the culture and propagation time before you get to harvest any of your green sprouts produce? What climate or soil temperature does this plant favor? Is it possible to grow asparagus in the garden or a small lot? Now I’m pretty sure that with the set of questions I have raised above some of you might be thinking that you have the same idea as I do and not knowing so much about the plant hinders you from planting or raising them in your backyard. Well, there is always good news here at Vermiculture Composting blog because we did the research for you and if you are lucky to have landed on the same set of questions before planting your asparagus, you might find valuable information here. Don’t forget to share this post with friends. You have quite a number of choices. These can be via social media like pinterest, instagram, twitter and facebook or you can email it so others may also benefit from this post. Thank you in advance in that case. Please watch the video below from eHowHome by Allen Smith below. There are literally so many varieties of asparagus. At the grocery store or in your local market, you can see that there are varieties that look lean and slim while there are those that really bulk up in size comparable to your thumb but there are those that are green while there is white asparagus. The variety actually doesn’t matter. They all have the same benefits and a little different in taste. There are also those that exhibit a bit of a pale purple skin but basically, they all belong to one type of plant called perennial. They have a unique rooting system that supports growth in numbers of shoots called sprue. Asparagus are planted in a unique manner. Most farmers and growers or people who cultivate and raise these perennials. I myself had not experience in planting them so I have one of the biggest questions answered upon going to YouTube.Com to find out by watching a video which I have shared and posted above so you too will know how asparagus is planted. Basically, just the describe it, you try to make a bed with a 6″ inch to 12″ inch hole on it and you try to spread the planting material which is called as the asparagus crown, making it look and resemble like a spider web. As I’ve mentioned above, the asparagus roots or crown is the part of the perennial that is planted in a bedding with a hole size as described previously. Growing asparagus is just like raising a lazy crop but caring and knowing what type of bed it favors would give you a higher yield with quality shoots or sprue to harvest during spring time. yes, knowing what type of soil it grows more vibrant with is another issue to consider when planting asparagus. Remember that originally, they grow on marine medium or saline soil where no normal weeds can grow on top of them. On the other hand, you can transfer the crowns to grow them but if you want a big harvest, I strongly suggest to reserve a bigger space. The bigger the planting space, the more yield you will have. 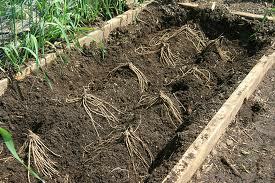 This is why you can’t grow anything else on the soil where asparagus is planted because when the roots start to find its way around your moist and well cultivated soil, it will reach probably more than a yard planting soil medium. If you ask me about the ideal time of the year or season for planting and growing asparagus, well, if you’ve watched Allen’s video above, you will learn that it is always best to plant early in the spring. It is also suggested to let the plant grown on its first feathery tall branches first and harvest on the next season of the year during summer. Harvesting asparagus is easy as pie especially if you know what part of the perennial is eaten. If you’ve seen them in your local grocery stores or at the market, you pretty much know what part of the plant is harvested during growing season. Yes, it’s the shoots or sprue that is being cut down and you can choose to cut them any length or size you want but one thing to consider though is the level of softness and crunchiness of the part where you will cut down the sprouts. I’m sure you wouldn’t want to eat the toughest part so when you harvest, think twice. Asparagus can be planted and grown from seeds because just like any other perennial plant types, they too grow flowers and eventually, seeds. These can be harvested too and planted but the time it will take to grow your asparagus from seeds would give you a hard time harvesting early compared to planting them by crown or roots which is readily available as planting materials in you local agricultural stores out there. Higher yield can also be had growing asparagus by seedlings but then again, if you want a faster way to get a harvest, consider planting crowns instead as mentioned above. Any fertilizer can be used in your beddings where you will plant the aspragus roots. But if you want to consider eating clean vegetable produce, I’d suggest that you use organic fertilizers. There are plenty of choices out there in your local stores. Just ask for specifics on how to administer application and how much amount your soil needs and don’t forget to tell the sales person where you will use it. If you’ve watched the video above by Allen, you’d find out that a composted manure is fine while adding some ash and crushed fertile animal bones will do. Again, I have mentioned above that by nature, asparagus grows in a more saline soil medium but because they have been propagated and cultured in small gardens these days, you can use just about any soil type. Just make sure to provide a regular fertilization by adding a mixture of compost or animal manure on it. Wikipedia also describes using a little amount of salt to suppress weeds. This will help you make sure your can get good healthy looking sprouts to harvest. You can buy asparagus planting materials from seeds to crowns at your local seedling stores and agriculture supplies. If you know someone who farms asparagus, you can also ask them to lend you a few crowns if they have it available. Propagation or culture of asparagus takes a whole year of season but after that, you’re sure to get your regular harvest depending on how much you have planted or how many crowns you are growing your sprue from. This means that if you planted your asparagus early spring, the next year would be the most ideal harvest. If you can grow more of its trunks, the better because this will be your base source of nutrient in growing healthier, more vibrant shoots for harvest. Climate of season for planting asparagus roots is during early spring so you have a whole season of growing them as they die and cast off shoots during winter but will grow back in the next spring season. A cold place is ideal so avoid as much as possible planting during summer season. Yes it is possible to grow asparagus is a small lot but an ideal size would be necessary to consider where you will have enough space for the roots to crawl and grow sprouts and shoots. This perennial is definitely not advisable to be planted in containers unless you a swimming pool size one. You can also try to read a complete guide on how to grow asparagus here.